For honeymoon, anniversary, or romantic getaway. Includes non-alcoholic Champagne, Chardonay or White Zinfandel or (provide your own spirits), complimentary wine glasses, fresh flowers, gift bath set, and breakfast delivered to your room. 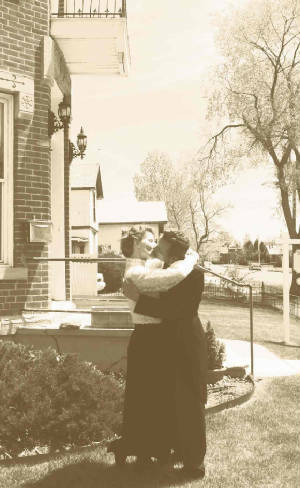 Also become one of our Olin House 'Historic Kissing Couples' which includes a special photo of the 'Kissing Couple' and one of you and your sweetheart. Makes for a special momento of your stay in our historic B&B. Other package available with or without dinner. Call for prices.